Literacy--and reading in particular--is the gateway to knowledge. What do you do if you want to learn more about something? You read about it. Oh, of course there are videos to watch and experts to apprentice. But how do you find out about those videos and those experts? You read. There's really no way to get around it. So reading is important. Really important. But how do you teach a kid how to read? This is definitely something I'm still working on. But after teaching preschool for a few years, consulting with other moms, and having some purposeful chats with a good friend of mine who teaches kindergarten, I have a very basic understanding of the mechanics that go into getting a kid from not knowing the alphabet to being able to read. Of course there are more things that go into this. Things like punctuation and the use of capital letters versus lower case letters. But for a mom who's sitting at home trying to figure out where to start with her child on preschooling, having a basic understanding of the progression of reading can be really helpful. It's a wonderful guide for figuring out where your child is at and what the next step is. So how do we help our kids progress from recognizing letters and learning the alphabet to being able to read on their own? There are a lot of great ways! The following are some of my favorite ways to help kids get a good start on the alphabet/reading as well as some wonderful tools that have been suggested to me by others. If you have a system that's worked well for your family, I hope you'll share it with us in the comments. Flashcards sometimes get a bad rep for being really mundane. Like, "Oh, that mean and rigid mother is the kind of person who uses flashcards with her kids." I've heard people refer to flashcards that way. Like it's a swear word. But, in my experience, little kids (and especially very little kids) love flashcards. They love the repetition, the concrete boundaries (i.e. what they need to know is right there on the card), and especially the one-on-one time with mom or dad. If you're in the market to buy some flashcards, I offer a set of very high quality Alphabet Flashcards in the printables section of my shop. The design is well-suited to young children and the fact that they come as a PDF allows you a lot more versatility than the store bought sets available everywhere right now. Additionally, this set comes with punctuation which will also stretch the use of flashcards much farther. You can read more about why these flashcards are especially great in the product description in my shop. Starfall is a free website that's geared toward preschool learning. I especially love the alphabet page. While it has expanded versions available for purchase (mostly for schools, but families can also buy them), I have been very satisfied with the free options so far. If you're getting started teaching your child the names and sounds of each alphabet letter, Starfall is a wonderful introduction/reinforcement to that. We started doing Starfall with Olivia before she could talk and she loved it. She'd just sit on my lap and soak it all in. Then, when she started talking, she'd start to say the names of the letters and comment on the other things she saw. Now that she knows the names of all of the letters in the alphabet really well, we've started working on the sounds that letters make and Starfall has been great for that too. She's already picking up on the sounds letters make really quickly. Also, I'd like to add here that one of the little bonus things I love most about Starfall as a mom, is the fact that there is no advertising on it. Not on the homepage and not in the activities. And there are no characters that they'll see at the grocery store check out and beg you to buy for them. It's just basic kid stuff. Love that. Flashcards and Starfall are wonderful tools when you're in the mood to sit down and work on learning the alphabet. But when you're out and about with your kiddo, take advantage of the world around you! Everything has letters on it. Just point them out and talk about them. When we lived in Utah there was this one stop light we got stuck at on the way home from the grocery store all the time. After a long trip at the store and being stuck in the car, Olivia would start to get cranky. So we started pointing out all the little flags hanging from the light posts that had letters on them. She loved it! She'd say the letters and point out new things too. Additionally, when I worked as an aide at the BYU preschool, many of the classrooms had a "word wall." Kids would bring in words cut out from cereal boxes and candy bars and other things they noticed that had letters on them and the teacher would help them tape the words onto the wall. 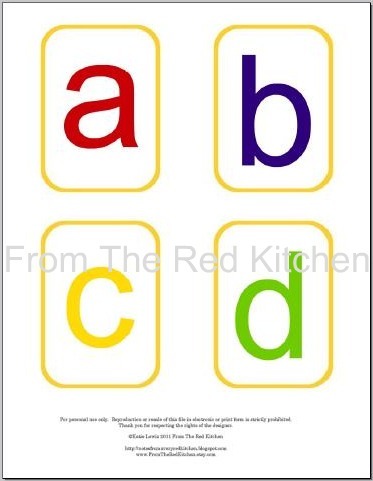 This is a great way to help kids recognize letters and get interested in reading and it would be easy to adapt for a preschool space at home. 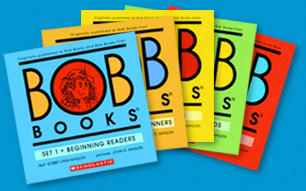 I don't own any Bob books yet, but I have heard their praises sung from the rooftops by my sister Polly who uses them with her kids. These books are great for helping little kids start to read on their own. The words are easy and each book builds on the next. Also, each book focuses on a certain sound. This gives kids the opportunity to practice sounding out similar words several times in the same story. And, of course, these books are pretty short. Perfect for little attention spans. I just saw today that Costco is selling sets of the Bob books for $10/pack. I asked Polly if she thought that was a good deal and she said it was. She said they're usually $17/pack new and that you can sometimes find cheaper used sets, but that you can't always find a set that's used. Most importantly, take time to read with your child. Even just reading together for a few minutes a day does so much to give your kid a good start in the reading world. Not only is it good quality cuddle time, but it teaches them a lot about how we read books. For instance, when you follow the text with your finger as you read, it shows your child that the story you're telling comes from the words and not just the pictures. Also, it shows them how to hold a book--which way is up, which way is down, and from what direction we turn the pages. And--this is perhaps the most valuable lesson they'll learn--reading is important. It's important enough to you that you take time to read with them every day. It's so important that they see you reading on your own during the day. Showing your children that reading is important to you will help it become important to them. And once they've mastered the skills they need to read, the world is an open book. What a lovely, lovely post. The one thing I would add to the part about reading aloud and pointing out text as you read, is that it also teaches children that we read text from left to right, one line at a time. As readers, we so often take that text direction for granted, but it's critical for little ones to learn. Thanks, Katie! Really enjoyed the post. I'm working as a pre-k/kindergarten teacher now, so its fun to see what you're already doing. olivia will be ready for school soon! especially love the part about reading to kids. its seriously one of the best things you can do. one thing we do in our class a lot (and i didnt see it mentioned here) is rhyming games and activities to help develop auditory discrimination, which is very helpful when learning to read. So to preface I am a Montessori trained Preschool teacher so some of the things that I do are a little different then a "normal" preschool. In Montessori we only introduce the lower case symbol and the sound a letter makes initially. If you think about it there are 26 letters and for each letter there are 4 pieces of information that must be learned uppercase symbol, lowercase symbol, name and sound. But for 90% of reading you only need 2 of those, lowercase symbol and sound. When you eliminate the "extra" variables the children can put the sounds together so much sooner into words. Uppercase is introduced as they come accross it in a gramaticaly correct situation (NEVER NEVER write a childs name in all caps sorry that's my own personal pet peeve.) that way the rules are introduced as just how we do things not something that they have to memorize later. Sorry this is so long but this is my favorite area of the classroom.